Pack boats were developed over 150 years ago as short, fairly wide and very lightweight craft designed to be very maneuverable and easy to portage. They have an open hull, generally a low seating position (close or on the bottom of the hull), foot rest and are used with a double bladed paddle Originally designed for backwoods paddling in the Adirondacks, they’ve evolved with additional, sleeker hull shapes now available. Pack boats can be used for flat to moderate water lake and river paddling. And don’t underestimate them - a pack boat was recently used to solo through paddle the 740 mile Northern Forest Canoe Trail. Pack boats are ideal for paddlers who want the “drop in the gear, step in and go" open feeling of canoeing, but want the convenience of using a double bladed paddle, the additional stability from the low seating position and the ability to easily bring the family boat dog (or small child) along for the ride. Wenonah Wee Lassie: At 12' 6" and 25 lbs, the Wee Lassie is a dream to transport. It is also a stunning performer on the water. Designed for all paddlers, it marries historical design with our proven Kevlar construction to produce a modernized classic that the original designers could never have imagined. Wenonah Fusion: The Fusion is a uniquely designed solo blending features of both a canoe and kayak for recreation and fishing. It can be paddled with a double or single blade paddle and its foot controlled rudder makes maneuvering a cinch. The padded high back seat comes standard and allows for hours of comfort. 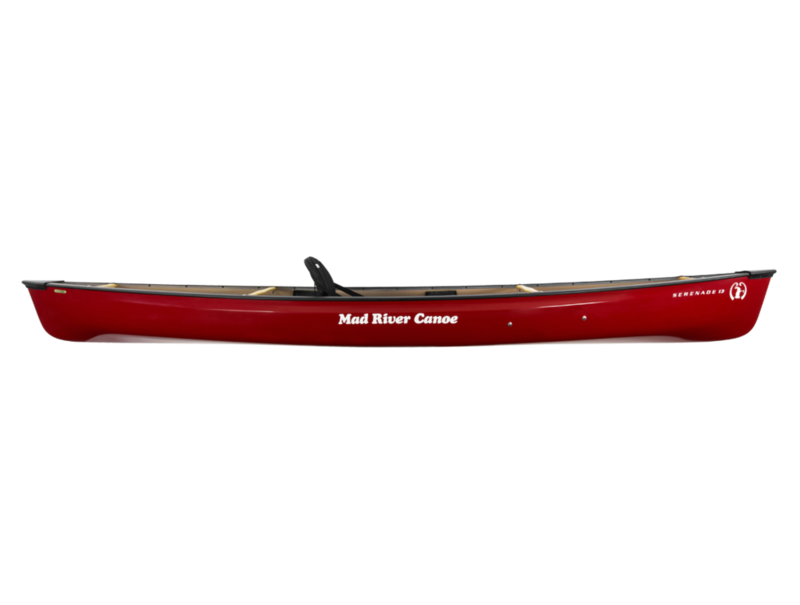 Mad River Serenade: The Serenade FGX features a classic kayak style seat that allows you to enjoy the best of both worlds. Used in conjunction with the adjustable footbraces, this provides a stable and efficient paddling position. The sophisticated, high performance “FGX” fiberglass lay-up is stiff, efficient, durable, and moderately priced for budget conscious paddlers that want the canoe aesthetic and functionality.